Planning and commencing field research can be a daunting prospect, often filled with ambiguity and lacking in structure. This workshop aims to demystify the research process, from conceptualising a topic to making initial phone calls and conducting interviews. It will leave participants more confident to tackle the challenges with which even experienced field researchers sometimes struggle. This open workshop is free of charge and will be held in English. Location: Lebanon Support office in Furn el-Chebbak (link to map: http://lebanon-support.org/contact). 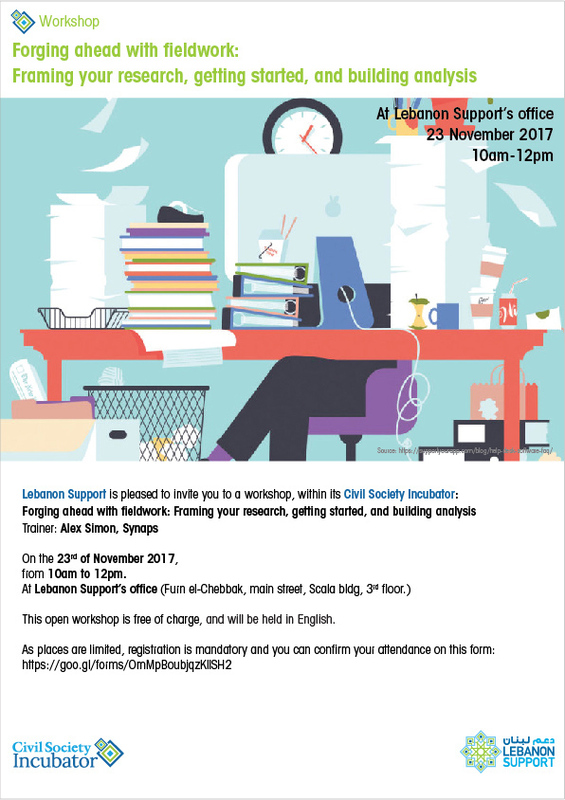 Please note that this same workshop will be offered in Arabic the following week on Tuesday, November 28th from 10am-12pm. Alex Simon is a Program Director at Synaps, a Beirut-based startup specialised in in-depth fieldwork and training programs for aspiring researchers. Since 2011 he has worked in various research capacities in Lebanon, Jordan, Palestine, and Washington, DC, including with the International Crisis Group and as a Fulbright Fellow. He continues to find the early stages of any research project the most challenging – but also the most rewarding – aspect of his work. He holds a BA from Princeton University and an MA from the Johns Hopkins School of Advanced International Studies.